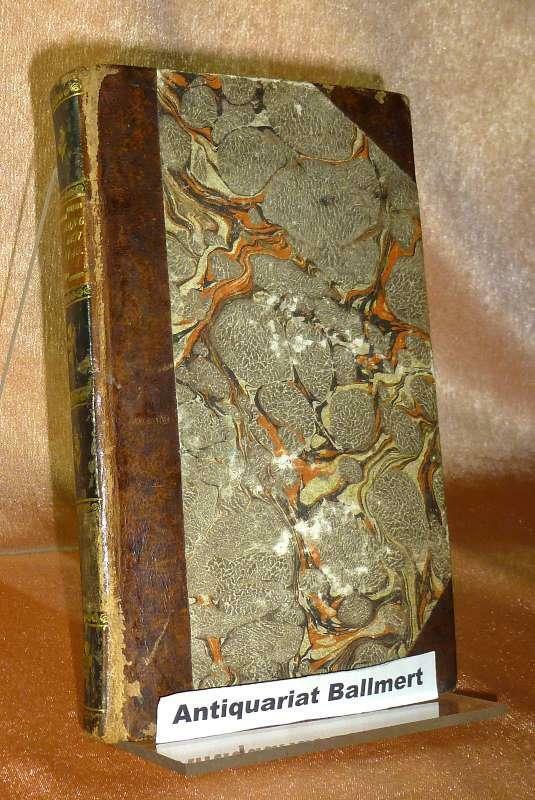 John Murray, 1820, Hardcover (Half Leather), Book Condition: Very Good Condition, Dust Jacket Condition: No Dust Jacket, First Edition. WALTER HAMILTON, ESQ. Description of Hindostan, and the Adjacent Countries, in 2 volumes, London: John Murray, 1820. 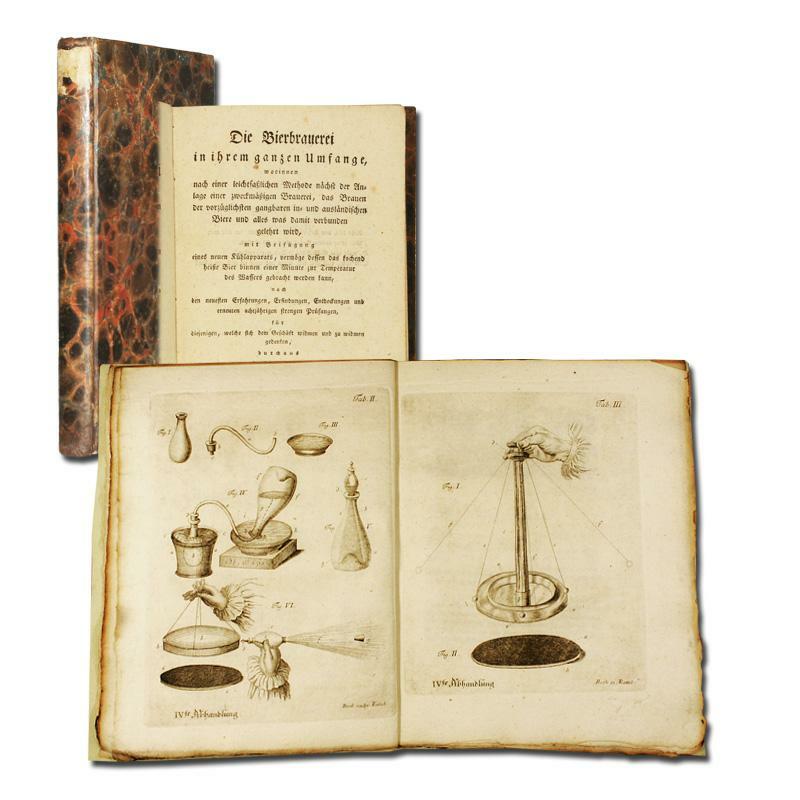 Quartos, first editions, pp. xlii, large folding map, 766; iv, 830, 1 (addendum), gray cloth boards half-bound in brown sheep with black morocco labels on spines, folding map measuring about 31x25 inches or 79x64cm, drafted and engraved by Sid. Hall for John Murray. Covers what we know as Afghanistan, Pakistan, Nepal, Tibet and Bhutan. As author of this work and the East-India Gazetteer, Hamilton created for the British reader a detailed view of distant parts of the Empire. Condition of these books: Overall very good and clean, short tears in preliminary leaves and in lower center of map, hinges cracked, moderate wear to covers. Size: Quarto. 2-volume set (complete). Text body is clean, and free from previous owner annotation, underlining and highlighting. Binding is tight, covers and spine fully intact. All edges clean, neat and free of foxing. Quantity Available: 1. Shipped Weight: Over 3 kilos. Category: Antiquarian & Rare; India; 19th century; Travel & Places. Pictures of this item not already displayed here available upon request. Inventory No: 53707. Roman Costumes Drawn from Nature by Pinelli and C. Hullmandel on Stone by C. Hullmandel. The Life and Adventures of Don Quixote de la Mancha. London: Printed for Hurst, Robinson, and Co.,, 1820. A new edition: with engravings from designs by Richard Westall. 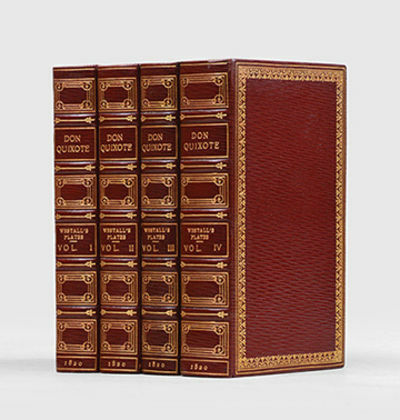 4 volumes, octavo (167 x 106 mm). Later red crushed morocco by Bayntun, raised bands to spines ruled in gilt, compartments lettered and panelled in gilt, double gilt rule border to covers with gilt floral roll, floral gilt roll to turn-ins, marbled endpapers, edges gilt. Engraved frontispieces with tissue guards, title vignettes, 16 plates by Charles Heath after Richard Westall. Pale spotting to prelims, occasionally to text blocks, scuffs to covers of vol. 3, otherwise an excellent, handsomely bound set. First Westall-illustrated edition. Richard Westall (17651836) was "a significant and innovative figure in the development of the English watercolour, his elegant and precise book illustrations set new standards in that field, and his portraits and historical and religious paintings have deservedly received more scholarly attention recently than hitherto" (ODNB). 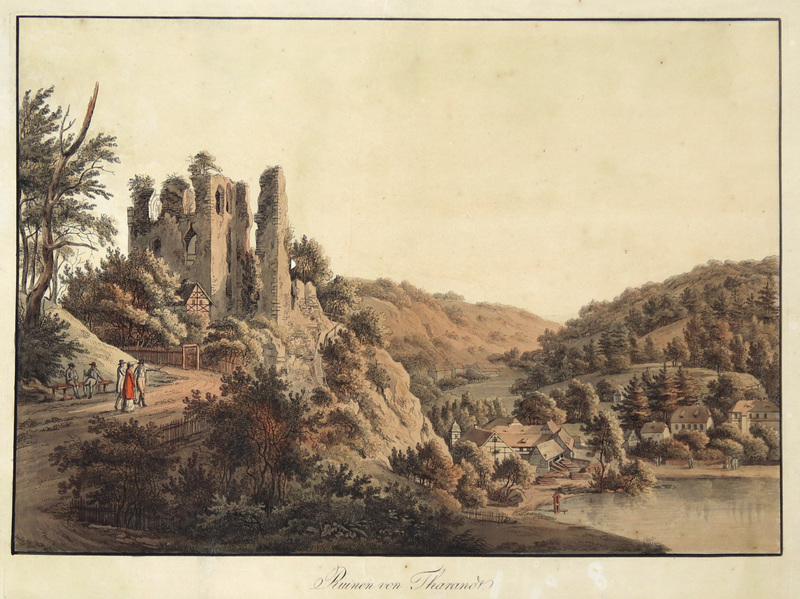 TA., Burgruine, "Ruinen von Tharandt". - Lithographie v. Cogels, vor 1820, 19,5 x 28 Winkler, Inkunabeln der Lithographie, Nr. 130 / 45. 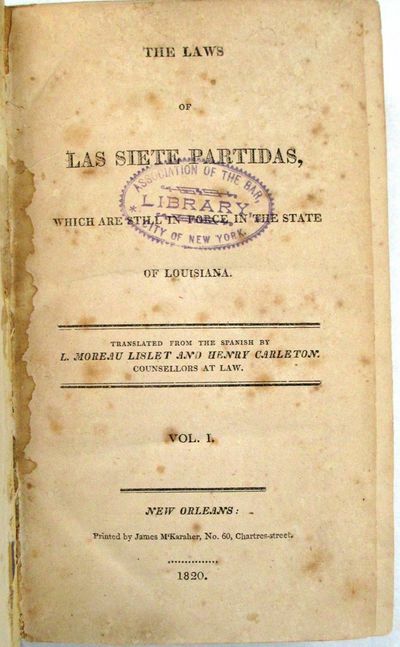 THE LAWS OF LAS SIETE PARTIDAS, WHICH ARE STILL IN FORCE IN THE STATE OF LOUISIANA. New Orleans: Printed by James M'Karaher, 1820. Two volumes. xxv,[1 blank], 605; ,612-1248,,73, [1 blank], [1 errata] pp. Scattered foxing and light wear, bound in modern cloth with gilt-lettered and lightly chipped morocco spine labels. Institutional rubberstamps, Good+. The Preface explains, "The laws of Spain are contained in various codes, the most complete of which is that known under the name of Las Siete Partidas," i.e., 'The Seven Parts,' which comprise "the fundamental principles of the laws of Spain." Cohen says, "This translation of the Spanish code, from which the Civil Code of Louisiana (1808) was derived, was made by order of the legislature. The translator's preface sketches the history of Louisiana law from the provincial through the territorial periods." "Great praise is due to the 13th century Spanish jurists who wrote the Partidas; for they produced not only a highly scientific code of law, the most notable of the age, but also the most complete treatise of jurisprudence yet published. The Partidas exercised enormous influence on Spanish law other than Castillian..." [Marke]. Cohen 5294. Marke 245. Jumonville 336, 337. Sabin 42244 ["a curious and learned work"]. Not in Harv. Law Cat. Studienblatt mit Laubbäumen und Füchsen, um 1820. - Bleistift, auf gelblichem Velin mit Wasserzeichen: Initialen FHF. 44,8:27,4 cm. &#150; Insgesamt etwas fleckig. Das Papier stammt von einer deutschen Papiermühle und wurde von Fries bis Herbst 1823 verwendet. (Wechssler, S. 389). One long folding lithographed plate & one folding printed table. 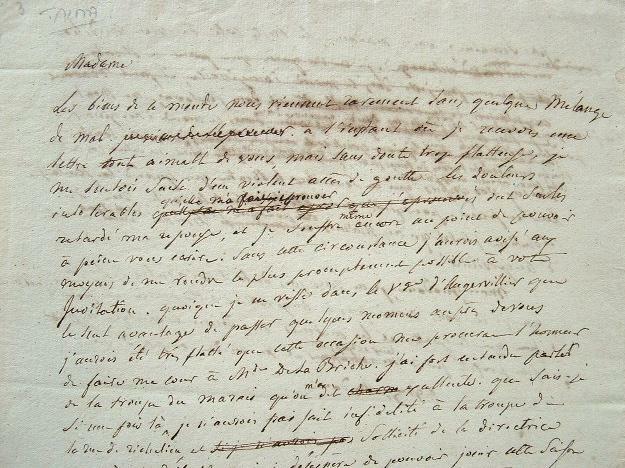 2 p.l., v,  (including the leaf of "explication de la planche"), 320 pp., one leaf of errata. 8vo, cont. red morocco, sides gilt, with arms in gilt of Francis I, the first Emperor of Austria, on each cover, flat spine gilt, a.e.g. Amiens: Caron-Vitet, 1820. 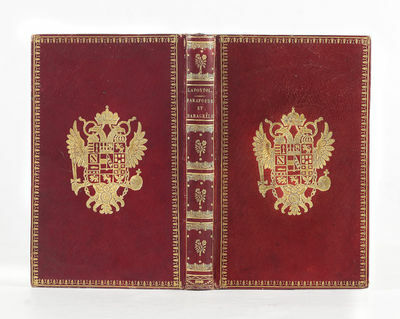 First edition and a lovely copy from the library of Francis I (1768-1835), the final Holy Roman Emperor and the first Emperor of Austria, with his arms in gilt on the covers. Lapostolle was an apothecary at Amiens and studied under Cadet de Vaux. Taking Franklin's researches as his starting point, he gives first a general survey of the current state of electrical science, and then a description of his straw-rope lightning rods, which could be used both on buildings and adapted for use in fields to prevent the destruction of crops by hailstorms. This fascinating work contains one of the stranger illustrations in the history of early electrical books: it is a long lithographed plate depicting the construction of the rods and a view of a village and surrounding fields equipped with them. It very much resembles a modern wind farm. A very fine and handsome copy with half-title. With the copyright notice on verso of title signed by the author. Bookplates of Fernand J. Heitz and Jean-Claude de Rocha Carneiro. &#10087; Wheeler Gift Cat. 771. London: John Murray, 1820. In fine condition, in a good Morrell binding.. Quarto, with three folding charts, two folding tables, a folding engraved plate and five aquatints, two with original hand-colouring, in later half red-brown morocco, gilt, all edges gilt, by Morrell. First edition of John Oxley's narrative of his two major expeditions, the first detailed description of the Australian interior and the earliest book devoted to Australian inland exploration. This is a very attractive copy of the most handsome of all Australian exploration journals, a finely produced quarto volume whose appearance recalls the earlier quartos of the First Fleet chroniclers and was clearly designed to rank on the shelf with the books by his illustrious predecessors like Phillip, Hunter, Tench, Collins, White, Grant and Flinders. It "is undoubtedly the chief book-making achievement of the Macquarie period..." (People, Print and Paper).Following the discovery of the Lachlan River by Evans in 1815, Macquarie appointed Oxley to lead an expedition to determine the course of the river and investigate its potential. Evans was appointed as second-in-command and Allan Cunningham was appointed as botanist. Setting out from Bathurst in April 1817 Oxley named the Macquarie River, explored the Lachlan and travelled about twelve hundred miles. But his findings on this first expedition were of some disappointment and Oxley recorded in his journal 'I was forced to come to the conclusion, that the interior of this vast country is a marsh and uninhabitable...'.A second expedition, to determine the course of the Macquarie River, was mounted in 1818 again with Evans as second-in-command to Oxley. After being bogged down in marshy country, Oxley split the expedition into two parties: he persevered into the Macquarie Marshes, whilst Evans travelled to the north-east and discovered the Castlereagh River. After regrouping Oxley and Evans headed eastwards, discovering the Liverpool Plains, the Peel River, and the New England tableland, before reaching the coast, discovering the Hastings River and Port Macquarie. He recorded his relief: '...on gaining the summit... we beheld the ocean at our feet. Every difficulty vanished, and, in imagination, we were already home...'.Although their prime objective had not been met, the expedition had seen some exceedingly important discoveries including lush grazing pastures and a fine harbour. As a result, in 1819 Oxley sailed to Port Macquarie on board the Lady Nelson, together with King and Roe on the Mermaid, where Roe in particular was instrumental in charting the harbour and examining the head of the River Hastings. 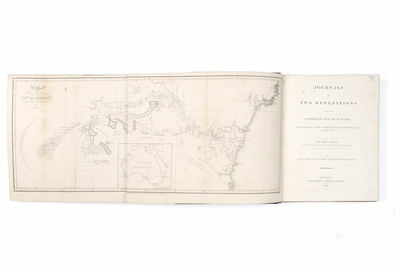 The appendices in the present volume include comments relating to this latter voyage, notably a letter from Oxley to Governor Macquarie dated 12 June 1819.The finely-drawn maps and aquatints include views drawn by Major James Taylor from sketches by Evans, and the striking portrait "A Native Chief of Bathurst", prepared after a drawing by John Lewin, and one of very few known Aboriginal subjects by Australia's first professional artist. Berchtesgadener Land mit Dorfhäusern im Vordergrund, Juni/Juli 1820. - Bleistift, auf Velin. 22,5:36,4 cm. &#150; Größerer Einriß im Bereich des Himmels nahezu unsichtbar restauriert. Verso mit Nachlaßnummer &#132;321" im Konvolut 313-324 &#132;12 Blätter Skizzen" (Lehmann, S. 244); vgl. Wechssler WV 45-61, besonders aber WV 51, die stilistisch mit unserer Zeichnung absolut vergleichbar ist. Diese erste Alpenreise führte Fries über das Alpenvorland und Berchtesgaden nach Salzburg. Italian scenery. 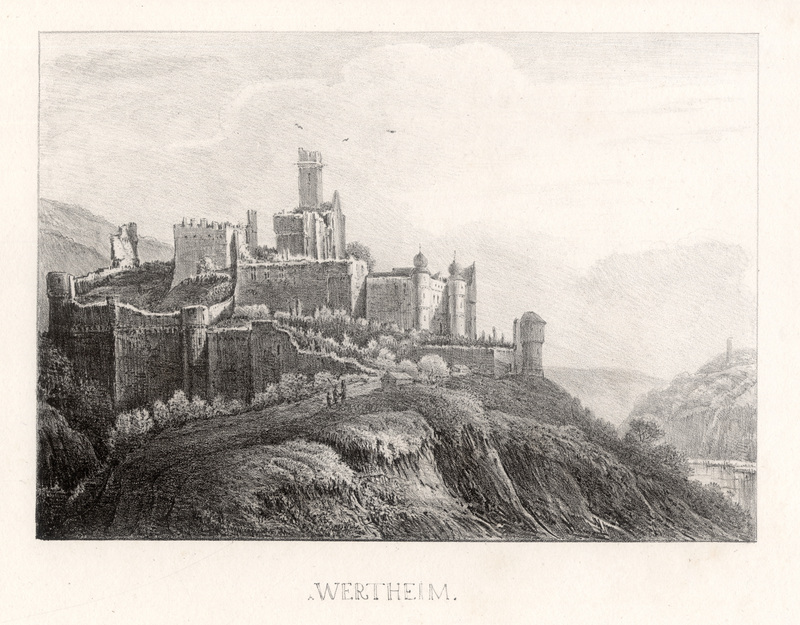 From drawings made in 1817. London, Rodwell & Martin, 1820, 4to bella legatura in piena pelle coeva con quattro cornici concentriche e decorazioni florali impresse in oro ai piatti, titoli e fregi dorati al dorso, doppia filettatura in oro ai bordi interni di entrambi i piatti, tagli dorati, pp. (8)-197 con una bella veduta incisa al frontespizio ed altra in fine al volume e con 60 tavole di vedute incise su acciaio a piena pagina. Prima edizione. Lievi aloni, tracce di antiche gore alla parte superiore dei margini bianchi; buona copia. 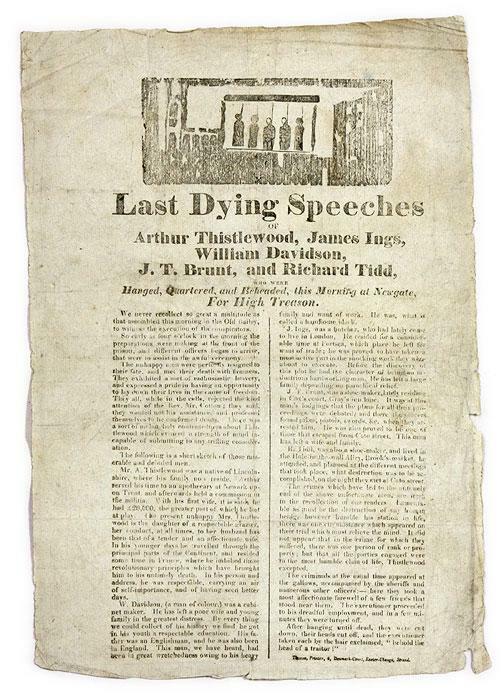 Last Dying Speeches of Arthur Thistlewood, James Ings, William..
1820. London, 14-3/4" x 10" broadside. London, 14-3/4" x 10" broadside. "The Unhappy Men Were Perfectly Resigned to Their Fate" [Broadside]. [Executions]. [Cato Street Conspiracy]. Last Dying Speeches of Arthur Thistlewood, James Ings, William Davidson, J.T. Brunt, And Arthur Tidd, Who Were Hanged, Quartered, And Beheaded, This Morning at Newgate for High Treason. [London]: Thomas, Printer, 6 Denmark Court, Exeter Change, Strand, . 14-3/4" x 10" broadside, untrimmed edges. Woodcut execution scene depicting five bodies hanging from a gallows above headline. Text in two columns. Light soiling, some wear and a few tiny chips to edges, faint horizontal and vertical folds. $2,500. * A rare example of street literature, this unrecorded execution broadside commemorates the Cato Street Conspiracy. Led by Arthur Thistlewood, the Conspiracy was an attempt to murder all of the ministers and prime minister of King George IV in 1820. Motivated in part by the economic depression of the period, the conspirators wished to avenge earlier protests suppressed by the state, such as the Paterloo Massacre. The conspirator's goal was to overthrow the government and initiate a revolution similar to the French Revolution. Thomas's broadside is interesting. Published during a period of radical upheaval, it offers a mixed ideological message, most likely to maximize sales by appealing to a wide audience of varied sympathies (and to avoid charges of seditious libel). For example, at the beginning of the text Thomas describes the men with the language of martyrdom: "The unhappy men were perfectly resigned to their fate, and met their death with firmness." Dispelling this sense of heroism, he then says: "The following is a short sketch of those miserable and deluded men." There is also a bit of chicanery in this account. None of these men were allowed to offer final speeches and they were not drawn and quartered. No copies listed on COPAC or OCLC. FLORENZ. 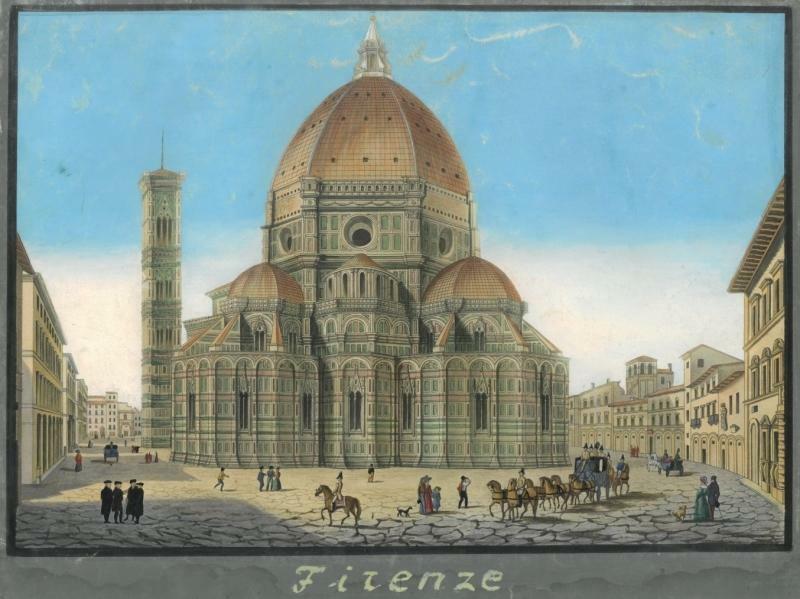 "Firenze". Links der Campanile di Giotto, im Mittelpunkt der Dom, davor hübsche Staffage mit Kutschen, Reitern und vielen Spaziergängern. - Altgouachierte Umrißradierung, um 1820, 23,5 x 33,5 cm. In der grau gouachierten Umrandung leicht wasserrandig und berieben. Sehr dekorativ und aufwendig gerahmt. De la folie Considérations sur cette maladie, son siège et ses symptômes ; la nature et le mode d'action de ses causes ; sa marche et ses terminaisons ; les différences qui la distinguent du délire aigu ; les moyens de traitement qui lui conviennent ; suivies de recherches cadavériques. 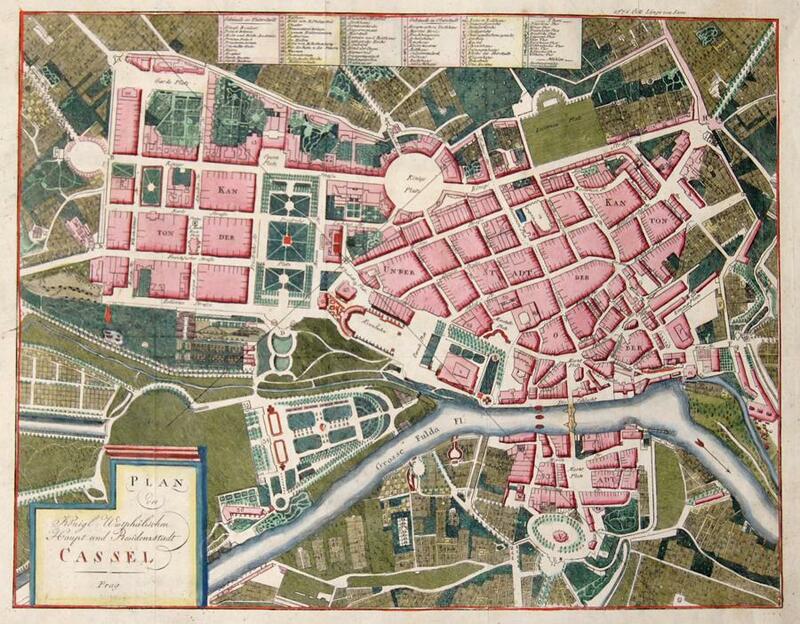 Artist: Anonymus ca ; issued in: Prag; date: ca1820 - - technic: Copper print; - colorit: colored; - condition: Folded; - size (in cm): 28,5 x 36,5; - description: Detailed city map of Kassel with description of all important buildigns and streeets. Kassel is a city located on the Fulda River in northern Hesse, Germany. The city's name is derived from the ancient Castellum Cattorum, a castle of the Chatti, a German tribe that had lived in the area since Roman times. 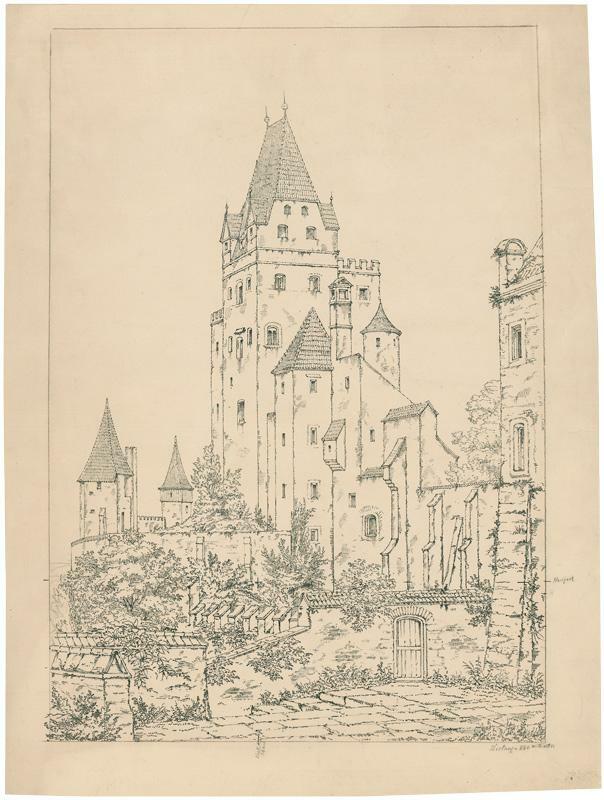 In the early 19th century, the Brothers Grimm lived in Kassel. They collected and wrote most of their fairy tales there. Having sided with Austria in the Austro-Prussian War to gain supremacy in Germany, the principality was annexed by Prussia in 1866. The Prussian administration united Nassau, Frankfurt and Hesse-Kassel into the new Prussian province of Hesse-Nassau. Kassel ceased to be a princely residence, but soon developed into a major industrial centre, as well as a major railway junction. Henschel & Son, the largest railway locomotive manufacturer in Germany at the end of the nineteenth century, was based in Kassel. 1820. Volume di cm. 22; 100 vedute incise in rame della città di Roma, alcune firmate Pietro Barboni, di cm. 13x10 alla battuta del rame; 40 vedute di Milano e luoghi vicini, incise da C. Lose e stampate da Vallardi, di cm. 16x11 alla battuta del rame. Elegante legatura in mezza pelle coeva, titoli e ricchi fregi in oro al dorso, piatti in carta marmorizzata, esemplare interfogliato con fogli non scritti. Qualche piccolo difetto ma ottimo esemplare. Gustosissimo souvenir dell'Italia ottocentesca raccolto da un antico amatore viaggiatore francese, mettendo assieme due album originariamente in oblungo come si evince dai forellini di legatura al margine esterno bianco delle tavole. [Opera proposta da: Galleria La Stampa Antica] € 900. Die Bierbrauerei in ihrem ganzen Umfange, worinnen nach einer leichtfaßlichen Methode. das Brauen der vorzüglichsten gangbaren in- und ausländischen Biere und alles was damit verbunden gelehrt wird. One long folding lithographed plate & one folding printed table. 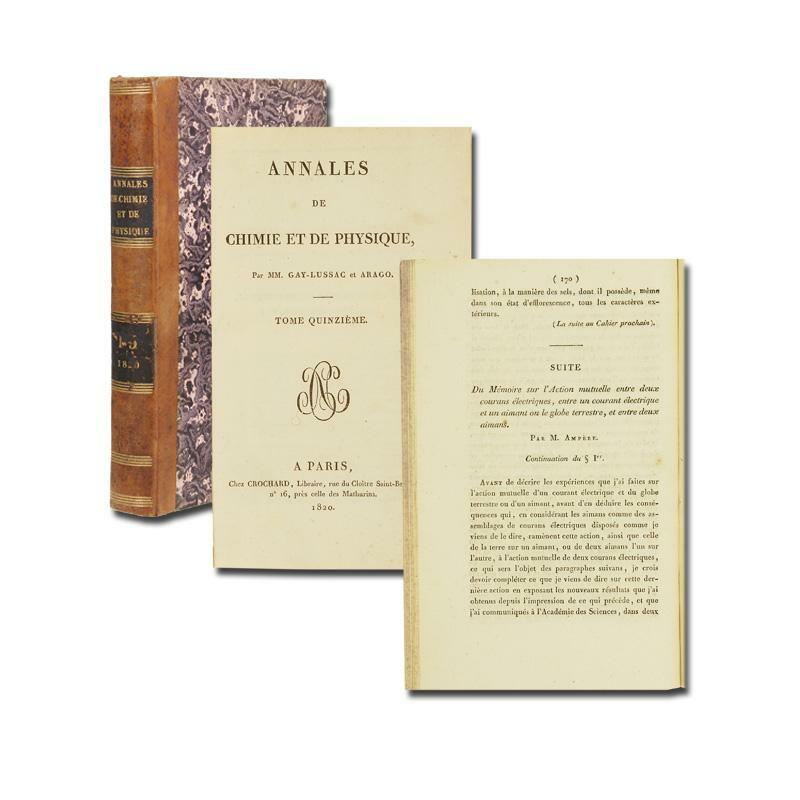 2 p.l., v,  (including the leaf of "explication de la planche"), 320 pp., one leaf of errata. 8vo, cont. red morocco, sides gilt, with arms in gilt of Francis I, the first Emperor of Austria, on each cover, flat spine gilt, a.e.g. Amiens: Caron-Vitet, 1820.First edition and a lovely copy from the library of Francis I (1768-1835), the final Holy Roman Emperor and the first Emperor of Austria, with his arms in gilt on the covers. Lapostolle was an apothecary at Amiens and studied under Cadet de Vaux. Taking Franklin's researches as his starting point, he gives first a general survey of the current state of electrical science, and then a description of his straw-rope lightning rods, which could be used both on buildings and adapted for use in fields to prevent the destruction of crops by hailstorms.This fascinating work contains one of the stranger illustrations in the history of early electrical books: it is a long lithographed plate depicting the construction of the rods and a view of a village and surrounding fields equipped with them. It very much resembles a modern wind farm.A very fine and handsome copy with half-title. With the copyright notice on verso of title signed by the author. Bookplates of Fernand J. Heitz and Jean-Claude de Rocha Carneiro.❧ Wheeler Gift Cat. 771. London: John Murray, 1820. First. hardcover. very good(+). Numerous engraved plates by Landseer, Cooke and others, protected with tissue. 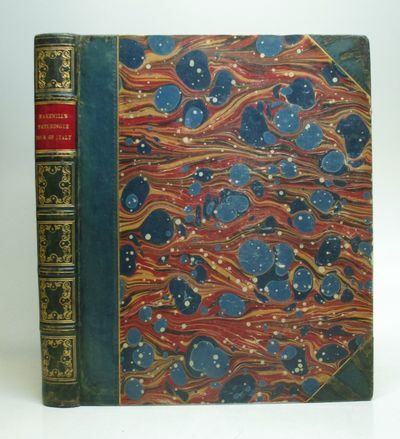 4to, 3/4 green calf over marbled boards, ornately gilt spine with red morocco label, a.e.g. London: John Murray, 1820. First edition. Occasional small library stamps not effecting the text or images, scattered foxing but still a very good(+) attractive copy. 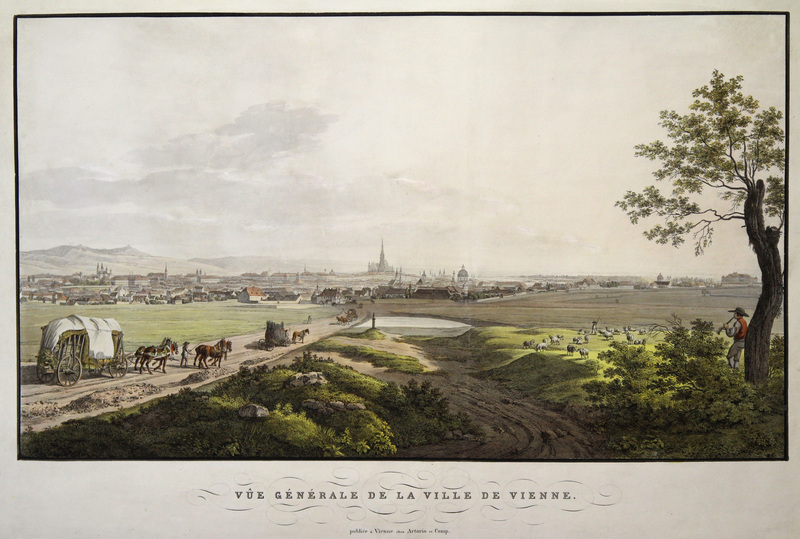 Gesamtans., von Süden, "Vue Générale de la Ville de Vienne.". - altkol. Umrißkupferstich v. Leopold Beyer n. Jakob Alt b. Artaria in Wien, 1820, 38 x 66 Nicht bei Nebehay/Wagner. Paulusch, W5452. - Sehr dekorative Ansicht von Wien. Der Betrachter blickt vom Wienerberg zur Stadt, mittig der St. Stephansdom. 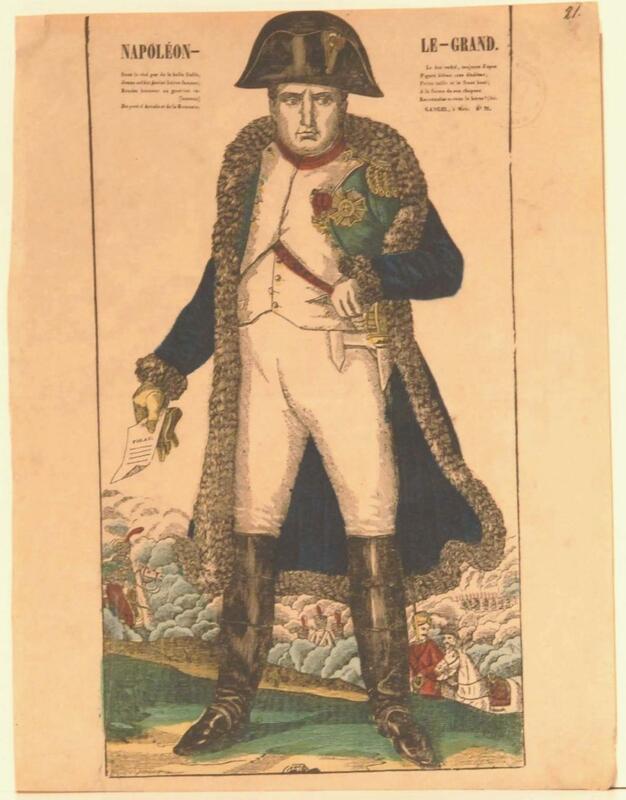 Das Blatt in sehr schönem Kolorit mit breiten Rand, auf Papier "Whatman 1820". Last Dying Speeches of Arthur Thistlewood, James Ings, William. 1820 - London, 14-3/4" x 10" broadside. "The Unhappy Men Were Perfectly Resigned to Their Fate" [Broadside]. [Executions]. [Cato Street Conspiracy]. Last Dying Speeches of Arthur Thistlewood, James Ings, William Davidson, J.T. Brunt, And Arthur Tidd, Who Were Hanged, Quartered, And Beheaded, This Morning at Newgate for High Treason. [London]: Thomas, Printer, 6 Denmark Court, Exeter Change, Strand, . 14-3/4" x 10" broadside, untrimmed edges. Woodcut execution scene depicting five bodies hanging from a gallows above headline. Text in two columns. Light soiling, some wear and a few tiny chips to edges, faint horizontal and vertical folds. $2,500. * A rare example of street literature, this unrecorded execution broadside commemorates the Cato Street Conspiracy. Led by Arthur Thistlewood, the Conspiracy was an attempt to murder all of the ministers and prime minister of King George IV in 1820. Motivated in part by the economic depression of the period, the conspirators wished to avenge earlier protests suppressed by the state, such as the Paterloo Massacre. The conspirator's goal was to overthrow the government and initiate a revolution similar to the French Revolution. Thomas's broadside is interesting. Published during a period of radical upheaval, it offers a mixed ideological message, most likely to maximize sales by appealing to a wide audience of varied sympathies (and to avoid charges of seditious libel). For example, at the beginning of the text Thomas describes the men with the language of martyrdom: "The unhappy men were perfectly resigned to their fate, and met their death with firmness." Dispelling this sense of heroism, he then says: "The following is a short sketch of those miserable and deluded men." There is also a bit of chicanery in this account. None of these men offered final speeches and they were not drawn and quartered. No copies listed on COPAC or OCLC. Praktische Lehre oder Anweisung über den Uhrenbau in seinem ganzen Umfange, nach welcher ein jeder Liebhaber die besten und richtigsten Uhren aller Art selbst auf eine leichte und faßliche Art verfertigen kann. TIROL. 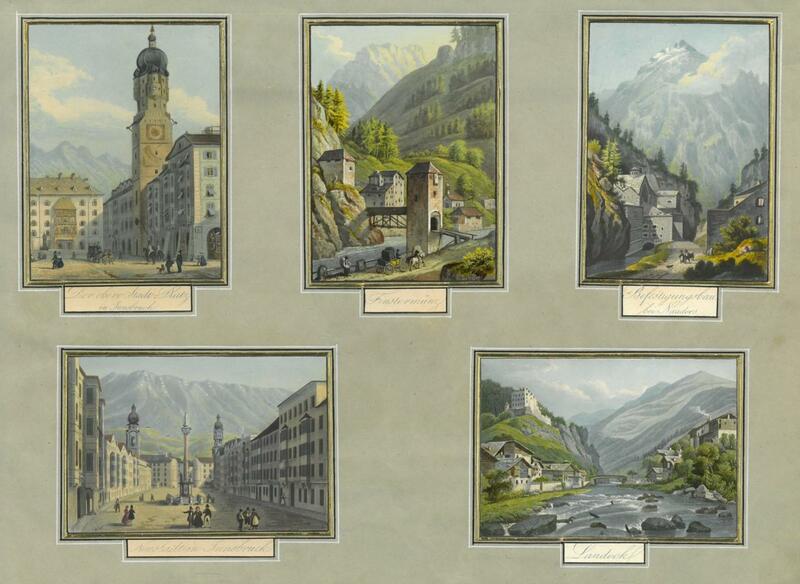 Albumblatt mit fünf Ansichten von Nordtirol: Innsbruck (2x), Finstermünz, Landeck, Nauders. IMPRONTE GEMMARIE ,DALLA COLLEZ. CADES NO.10 Box in book form containing plaster copies of Intaglios arranged front and back with manuscript indices.138 small plaster lozenges picturing boats, quadruped animals, birds, aquatic animals, insects, and chimera. These plaster casts of Greek and Roman and later Renaissance gems were collected by travellers undertaking a "grand tour"of Europe in the late C18th and early to mid c19th. The original engraved gems, frequently referred to as intaglios (or intagli) are small and usually semi-precious gemstones that have been carved, (in the Western tradition normally with images or inscriptions only on one face) "in intaglio" with the design cut into the flat background of the stone. Round or oval Greek gems (along with similar objects in bone and ivory) are found from the 8th and 7th centuries BC, usually with animals in energetic geometric poses, often with a border marked by dots or a rim. The Gems were mostly cut by using abrasive powder from harder stones in conjunction with a hand-drill. By the mid-eighteenth century prices for the original gems had reached such a level that collections could only be formed by the very wealthy; less wealthy travellers and collectors made popular the collecting of plaster casts such as these. A generic term for the field of carved stones is "glyptic art".Although such stones have been collected since antiquity, their usual functions were as seals, often mounted in a ring. 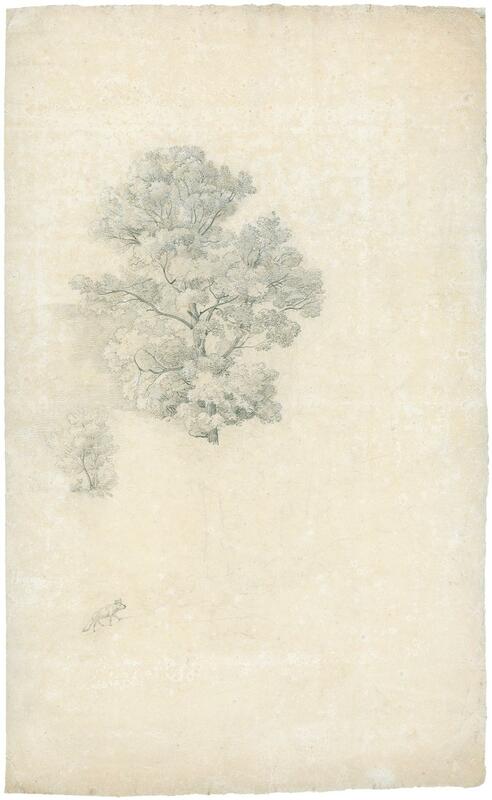 The designs register most clearly when viewed in wax impression or as here, in plaster. Mit gest. Titel, gest. Wappentafel, 129 gest. Portraits von D. Custos sowie Lukas u. Wolfgang Kilian gest., mit rückseitigem Text. 1 Bl. Register. - Angebunden: Signiertes Manuskripf des bayerischen Juristen, Historikers und Archivars Felix Joseph (von) Lipowsky: Materialien, Leitwaege und Ergaenzungen zur Genealogie und Geschichte (...) der Herren Fürsten und Grafen Fugger. München, 1820. 230 num. Bll. HLdr. d. Zt. 29 x 20 cm. VD17 12:648635H Kress S. 480 Lipperheide Da 8 (fälschlich 1618). - Seltene Ausgabe der schönen Porträtfolge mit deutschem Text. Die männlichen und weiblichen Mitglieder der verschiedenen Zweige des Hauses Fugger sind teils im Rechteck, teils im Oval in halber Figur dargestellt. - Das Manuskript enthält teils umfangreichere Biographien der Abgebildeten, meist mit besonderem Augenmerk auf die Verwandtschaftsbeziehungen. Nicht alle Portraitierten wurden von Lipowsky bearbeitet, so befinden sich zwischen den ausgearbeiteten Biographien auch eine Reihe weiß gebliebener Blätter. Es mag sich um eine Vorarbeit handeln, die woanders eine endgültige Fassung erfuhr. Eine Veröffentlichung des Manuskripts konnte ich allerdings nicht nachweisen, es ist aber sicher mit in die zahlreichen Arbeiten Lipowskys eingeflossen. - Etwas berieben und bestoßen. Vorderer Spiegel und fliegender Vorsatz mit handschriftl Register, wohl auch von Lipowsky verfasst. Kupfertitel verso gestempelt und seitlich mit Hinterlegung. Der Titel des Manuskripts verso gestempelt. Praktische Schönschreibekunst im neuesten Geschmacke. Verlegt und zu haben bei Jacob Micheletto, in der Jesuiten-Gasse im gräflich Buquoischen-Hause Nr. 85. Talma et les jours perdus. Voyage critique a l&#146;Etna en 1819. 2 Bände. - Lithographie v. Cogels, vor 1820, 19,5 x 28 Winkler, Inkunabeln der Lithographie, Nr. 130 / 33. 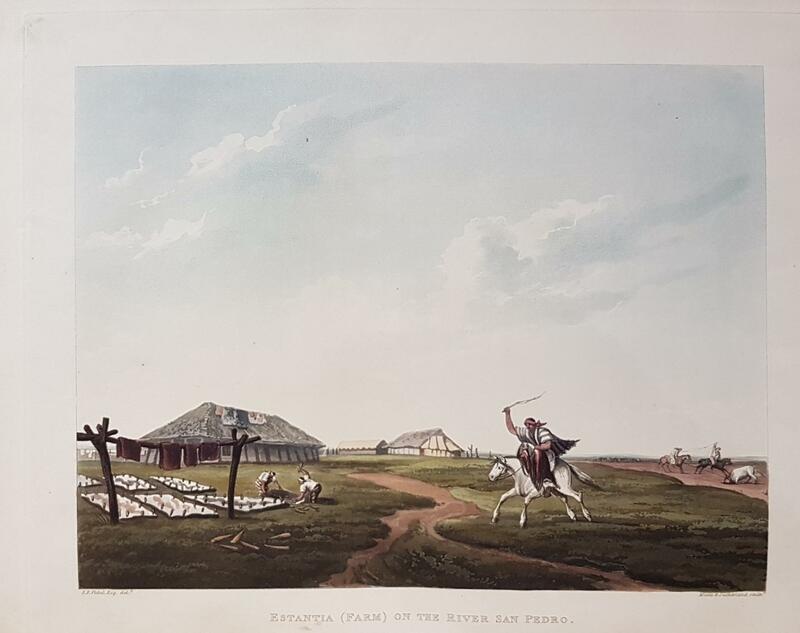 Picturesque illustrations of Buenos Ayres and Monte Video, consisting of twenty-four views ; accompanied with descriptions of the scenery, and of the costumes, manners, &c. of the inhabitants of those cities and their environs. 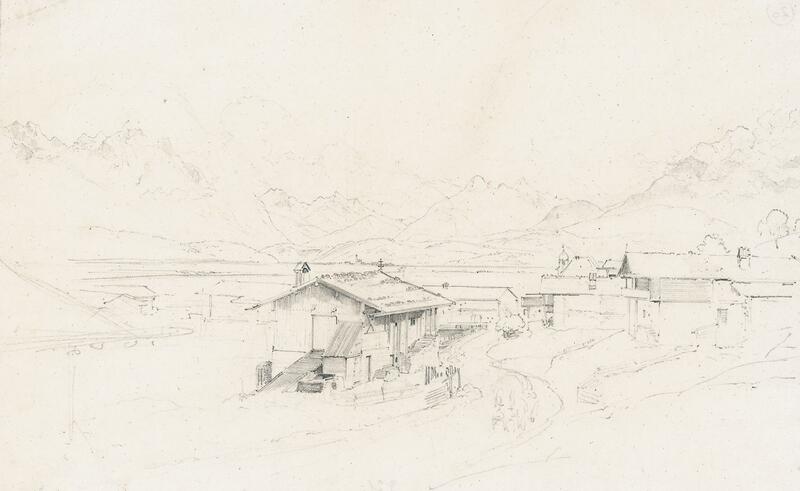 um 1820/25 - Feder-und Kreidelithographie um 1820/25, auf Velin. Probedruck. 51,8:38,9 cm.- Nicht bei Winkler. Wahrscheinlich Inkunabel der Lithographie. London: Hannah Humphrey, 1820. First Edition. Softcover. Very Good. Hand-colored by Cruikshank. Engraving on wove paper. 9-3/4 x 13-3/4 inches (w 33.8 x h 22.2 cm); 1 margin tear repaired. Trimmed. 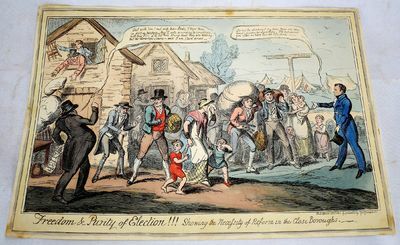 <br> In this print Cruikshank show the elections in Cornwall (Tregony and St. Austel), a close burrow. The villagers "have displeased their feudal proprietor, and are being summarily evicted from their houses, with their household belongings, by a truculent steward, with a list of the "proscribed" held in his hand. Old and young, women and children, are alike doomed, because they or their protectors have dared to act with independence, and have not voted according to the fiat of the lord of the manor. Daniel O'Connell appears as the unsuccessful candidate; he is viewing this mischief with compassion, and is encouraging those evicted 'not to be cast down, as there are other houses besides his lordship's,' and that he ... 'will not desert them, although they have lost the election.'" - Grego, Joseph. "A History of Parliamentary Elections and Electioneering in the Old Days," p. 340-341. <br> Refs: Cohn 1130. Catalogue of Political and Personal Satires preserved in the Department of Prints and Drawings in the British Museum, Mary Dorothy George, v. 10, no. 13710. <br> According to the back matter, this particular print was exhibited in Exeter Hall in 1863 and was hand colored by Cruikshank. London: Printed and Published By J. Robins and Co , 1820. 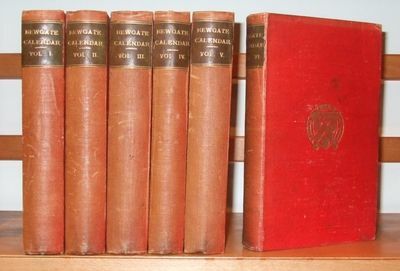 Complete in 6 volumes. Book measure 9 x 6 inches. No date, circa 1820. Collation, circa 3,000 pages, 54 full page plates, including frontispieces, 6 vignette title pages, lacking 4 plates. Bound in red cloth, with leather title labels, with crest of [ Trinity Collage Cambridge on top boards ]. Cloth lightly rubbed, some fading and dirt marking. Generally all binding in good firm condition. Internally, college label on fixed endpaper of each volume, some occasional light tanning or spotting. Pages and plates in good condition throughout. A good solid set. . 8vo. 1820. Chaffee French Series D. New York Public Library Digital Collections: Mme. Courtin (NYPL image ID 5095407); Melle. Fanny (NYPL image ID 1515914); Bigottini (NYPL image ID 5073713). Clari, ou La promesse de mariage, choreographed by Louis-Jacques Milon to music by Rodolphe Kreutzer (1766-1831) was first performed at the Académie Royale de Musique on June 19, 1820. Milon (?1766-?1849) was a French ballet dancer, choreographer, and ballet master. He produced highly successful ballets including Pygmalion (starring his young sister-in-law, Émilie Bigottini) and Héro et Léandre, after which he was named assistant ballet master to Pierre Gardel... "Another ballet that made a favorable impression several years later was Clari... with Bigottini and Albert in the principal roles. 'It was a typical example of pre-Romantic ballet,' said Ivor Guest (1980), 'with characters drawn from everyday life and its action evincing a rather naive sympathy with the common people.' " Monique Babsky in the International Encyclopedia of Dance, Vol. 4, pp. 422-423. 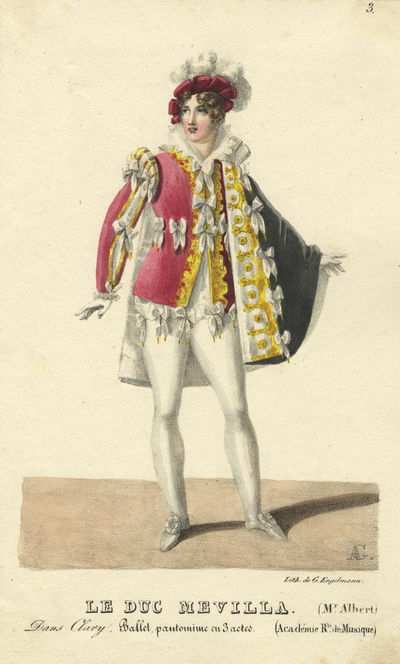 He was also considered the last "grand professeur" of pantomime at the Opéra." Wikipedia.. Each 225 x 140 mm. 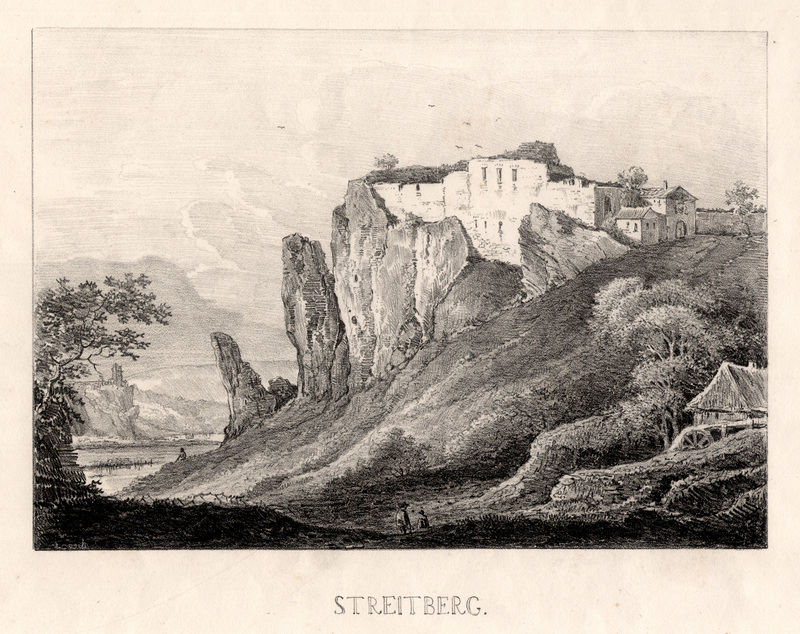 and drawn by Auguste Siméon Garneray (1785-1824), signed with initials in the stone ("A.G.") and lithographed by G[odefroy] Engelmann (1788-1839). Laid down at corners to mounting paper.